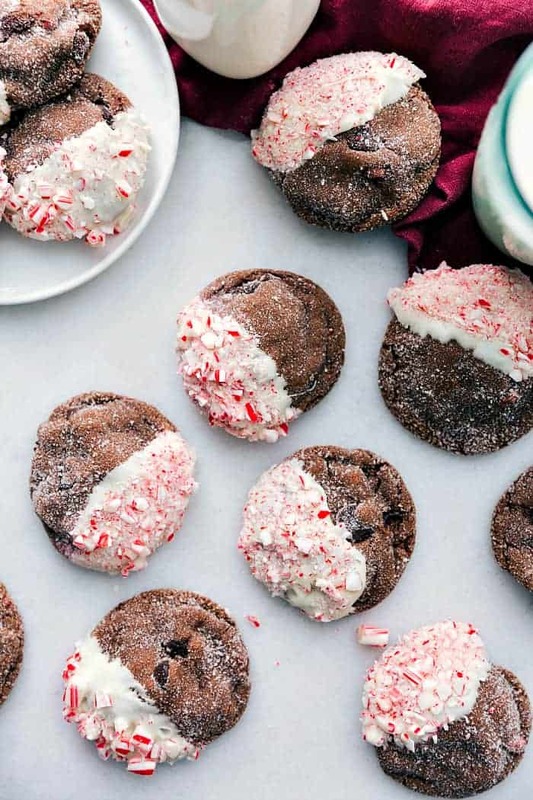 Chocolate Peppermint Gingersnaps are sure to impress all your friends and family at your next cookie exchange! These cookies are a soft, full of flavor, classic gingerbread cookie that will add the holiday cheer to any party or neighborhood gift. The white chocolate, peppermint and chocolate add just the right amount of flavor to enjoy a sweet and savory cookie. It is cookie exchange month! These cookies have gone from classic gingersnaps to “Oh, Wow” with a few extra ingredients that will bring your holiday plate together. When putting together your cookie exchange plates here are a few other cookies that will add a variety of fun to it Chocolate Snowball Cookies, Christmas Gooey Butter Cookies or these White Chocolate Cherry Cranberry Cookies. I am loving everything red and green this time of year, especially on a plate full of cookies! I am a huge fan of peppermint and love how it blends so well with the creamy white chocolate and soft chocolate cookies. Every bite is bursting with flavor! I have fallen in love with these remarkable cookies that have become a family favorite in our home. I am excited to share them with my friends and family this holiday season! 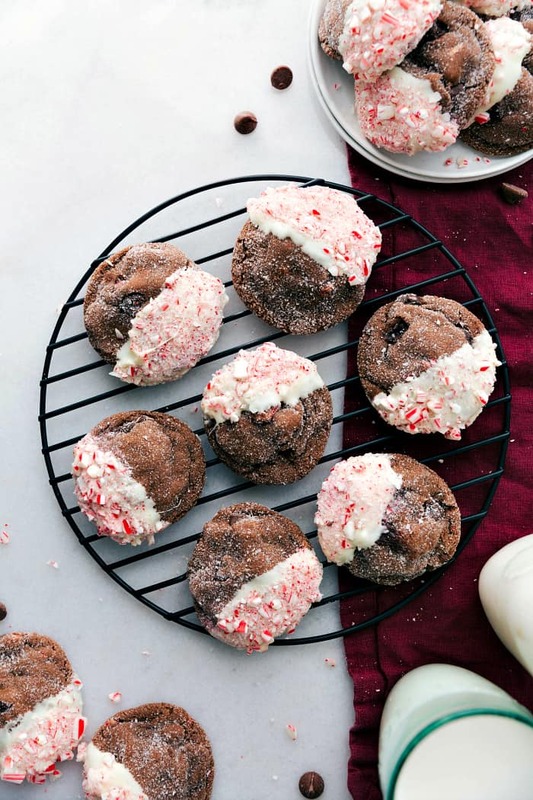 How Do You Make Chocolate Peppermint Gingersnaps? In the microwave melt 1 cup of the semisweet chocolate chips. Stir every 30 seconds until smooth. Cool. In another bowl, beat egg, 2/3 cup sugar, oil, corn syrup, and extracts. Beat in the melted chocolate. In another bowl whisk the flour, baking soda, and salt. Slowly beat it into wet mixture until combines. Fold in the crushed peppermint candies. Place the remaining sugar into a bowl and shape the dough into one inch balls and roll into the sugar. Place on a parchment lined baking sheet and bake until set for 12-15 minutes. Let cool. Once they are cooled, melt the white chocoalte chips in the microwave. 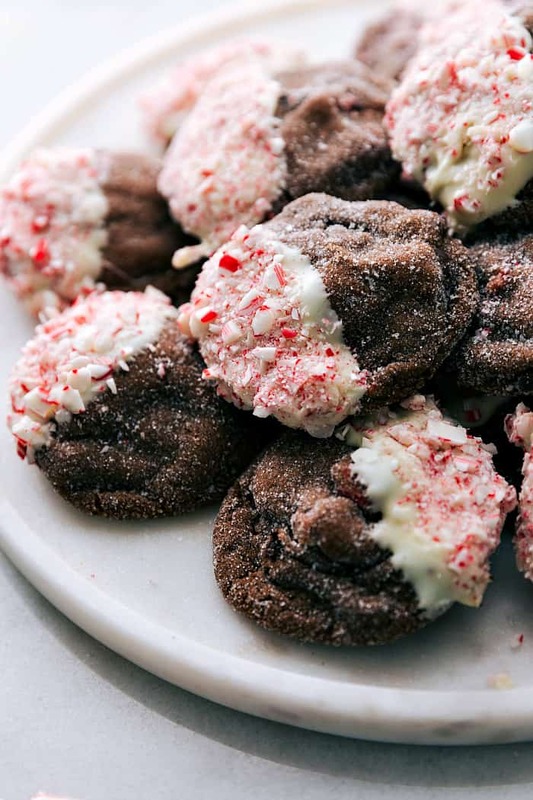 Dip half of the cookie into the melted chocolate and sprinkle crushed candy canes on top. 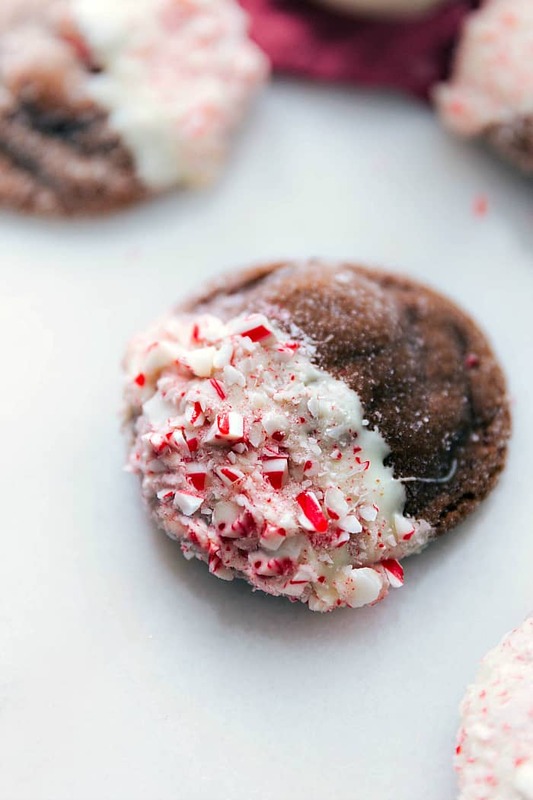 Can You Freeze Chocolate Peppermint Gingersnaps? Yes you can. You will want to freeze them separately on parchment paper so they will not stick. Once you take them out of the freezer and let them thaw, then take them slowly off the parchment paper without losing all their white chocolate and/or peppermint. You can also freeze the chocolate cookies without the white chocolate and peppermint garnish. When thawed, you can add the white chocolate and peppermint at that time. Looking For More Cookie Recipes with an added Twist? Try These! Preheat oven to 350 degrees. In the microwave melt 1 cup of the semisweet chocolate chips. Stir every 30 seconds until smooth. Cool. In another bowl, beat egg, ⅔ cup sugar, oil, corn syrup, and extracts. Beat in the melted chocolate. In another bowl whisk the flour, baking soda, and salt. Slowly beat it into wet mixture until combines. Fold in the crushed peppermint candies.